Most startup founders dream of being the next Steve Jobs or Mark Zuckerberg. Ijad Madisch, the co-founder and CEO of science network ResearchGate — a five-year-old service that has just announced a new round of venture funding — has rather different ambitions. And he’s not kidding. The Harvard-trained virologist and computer scientist put a fast track medical career on hold in order to concentrate on building a website that he hopes can change the face of science. The reason is simple. 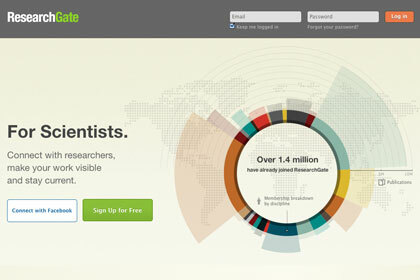 In the simplest terms, ResearchGate is referred to as “Facebook for scientists” — a social network where professional researchers can share their work, communicate with each other and ask questions. But because it focuses on sharing knowledge, rather than activity, it’s probably got more in common with the likes of Quora or Stack Overflow.